90 degrees expanding elbow fixing from the Assist range. To suit 1.25 inch medium weight tube to BS EN 10255 (formerly BS 1387). Alternatively, this part can be used with an Assist Wall Flange (JWICL731) to terminate the handrail at a wall. The Assist range of tube clamps from Interclamp has been specially designed to help compliance with the Disability Discrimination Act (DDA) and the Building Regulations Part M:2004. Parts in this range are designed for quick and easy installation without the need for special fittings or tools, welding, or threading. These parts are designed to allow you to easily integrate them when installing a new tubular structure or when refurbishing an older system. The range forms flush joints with size C42 tube In order to meet the requirements of the above standards. If necessary the tube and fittings can be coated in RAL or BS colours to help meet contrasting colour requirements and make them less clod to touch. Steps and disabled access slopes may easily be accommodated using these fittings. 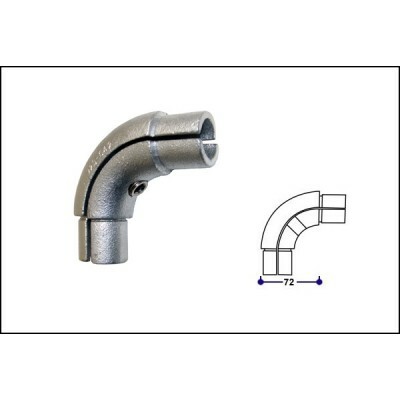 For C42 size internally expanding Assist fittings (as with type 150), tubes must be 42.4mm od x 3.2mm wall thickness e.g. 1.25 inch medium weight to BS EN 10255 (formerly BS1387). Any cut tube ends must be deburred and properly treated with an appropriate Silver Galvanising Spray or other suitable protection. Optional O-rings may be fitted to each end of the expanding Assist fittings to achieve the best finish.